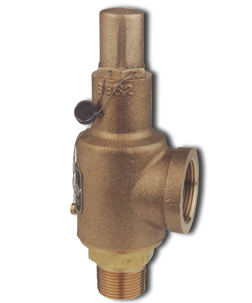 Rockwood Swendeman Pressure Relief valves are safety devices designed to protect pressurized vessels, lines or systems during an overpressure event. The recommendations below are general and it is the responsibility of the user to assure that installation and maintenance are in accordance with the applicable ASME Codes and local requirements. Special Teflon® seat,making bubble-tight seals possible to over 90% of set pressures per spec API 527; not applicable to steam. Meets A.S.M.E. Boiler and Pressure Vessel Code, Section VIII requirements. Especially recommended for those applications where corrosive or expensive gases benefit from stainless steel construction. - Inlet 1/2" to 2"
- Outlet 3/4" to 2-1/2"